The patient should have fasted for at least 12 hours prior to beginning the test. 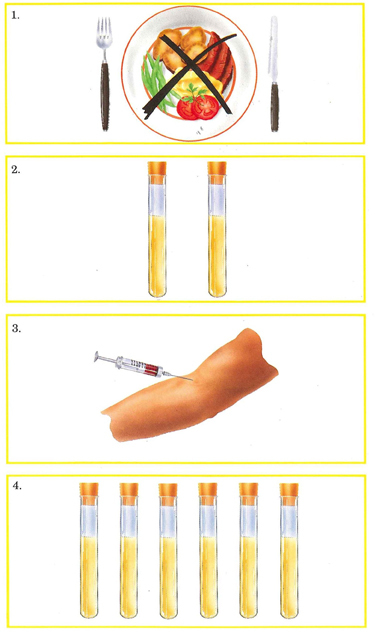 Prior to injection of ChiRhoStim® (Human Secretin for injection), two blood samples are drawn for determination of fasting serum gastrin levels (baseline values). Subsequently, a test dose of ChiRhoStim® (Human Secretin for Injection) 0.2 mcg (0.1 mL) is injected intravenously to test for possible allergies. Post-injection blood samples are collected after 1, 2, 5, 10, and 30 minutes for determination of serum gastrin concentrations. Gastrinoma is strongly indicated in patients who show an increase in serum gastrin concentration of at least 110 pg/mL over basal level on any of the post secretin injection samples. Then transfer the serum into a lavender colored frozen tube. Test turn around time is 24-72 hours. Please download the Package Insert. See the Endocrine Appendix for instructions on multiple specimen testing. Separate serum from cells. Transfer the serum into a LabCorp PP transpak frozen purple tube with screw cap (LabCorp No 49482). Freeze immediately and maintain frozen until tested. To avoid delays in turnaround time when requesting multiple tests on frozen samples, please submit separate frozen specimens for each test requested. Diagnose Zollinger-Ellison (Z-E) syndrome; diagnose gastrinoma. Gastrin >110 pg/mL with gastric acid hypersecretion (basal acid secretion >15 mmol/hour in a patient with peptic ulcer who has not had surgery) establishes unequivocally the diagnosis of the Zollinger-Ellison syndrome.4 Antral G-cell hyperplasia may relate to high gastrin levels and duodenal ulcer. Fifteen percent to 26% of Z-E patients have evidence of Werner syndrome (multiple endocrine neoplasia type 1). It may include hyperparathyroidism, islet cell tumors of the pancreas, pituitary tumors, Cushing syndrome (adrenal glands), and hyperparathyroidism.8 Gastrinoma are malignant in 62% of cases, and 44% of patients have metastases. No consistent relationship has been established between Helicobacter pylori (Campylobacter pylori) and gastric acid secretion or serum gastrin levels. Features of gastrinoma additional to those of peptic ulcer may include diarrhea and steatorrhea. Meites S, Buffone GJ, Cheng MH, et al, eds, Pediatric Clinical Chemistry, Reference (Normal) Values, 3rd ed, Washington, DC:AACC Press, 1989, 131. Sann L, Chayvialle AP, Bremond A, et al, “Serum Gastrin Level in Early Childhood,” Arch Dis Child, 1975, 50(10):782-5. Janik JS, Akbar AM, Burrington JD, et al, “Serum Gastrin Levels in Infants and Children,” Pediatrics, 1977, 60(1):60-4. Wolfe MM, “Diagnosis of Gastrinoma:Much Ado About Nothing?” Ann Intern Med, 1989, 111(9):697-9. Rakic S and Milicevic MN, “Serum Gastrin Level in Patients With Intestinal and Diffuse Type of Gastric Cancer,” Br J Cancer, 1991, 64(6):1189. Yanda RJ, Ostroff JW, Ashbaugh CD, et al, “Zollinger-Ellison Syndrome in a Patient With Normal Screening Gastrin Level,” Dig Dis Sci, 1989, 34(12):1929-32. Malagelada JR, Glanzman SL, and Go VL, “Laboratory Diagnosis of Gastrinoma. II. A Prospective Study of Gastrin Challenge Tests,” Mayo Clin Proc, 1982, 57(4):219-26. Jensen RT, Gardner JD, Raufman JP, et al, “Zollinger-Ellison Syndrome:Current Concepts and Management,” Ann Intern Med, 1983, 98(1):59-75 (review). Cherner JA, Doppman JL, Norton JA, et al, “Selective Venous Sampling for Gastrin to Localize Gastrinomas. A Prospective Assessment,” Ann Intern Med, 1986, 105(6):841-7. Clain JE, “Diagnosis and Management of Gastrinoma (Zollinger-Ellison Syndrome),” Mayo Clin Proc, 1982, 57(4):265-7.
den Hartog G, van der Meer JW, Jansen JB, et al, “Decreased Gastrin Secretion in Patients With Late-Onset Hypogammaglobulinemia,” N Engl J Med, 1988, 318(24):1563-7. Fraker DL and Norton JA, “The Role of Surgery in the Management of Islet Cell Tumors,” Gastroenterol Clin North Am, 1989, 18(4):805-30. Friesen SR and Tomita T, “Pseudo-Zollinger-Ellison Syndrome, Hypergastrinemia, Hyperchlorhydria Without Tumor,” Ann Surg, 1981, 194(4):481-93. Green DW, Gomez G, and Greeley GH Jr, “Gastrointestinal Peptides,” Gastroenterol Clin North Am, 1989, 18(4):695-733. Malagelada JR, Davis CS, O'Fallon WM, et al, “Laboratory Diagnosis of Gastrinoma. I. A Prospective Evaluation of Gastric Analysis and Fasting Serum Gastrin Levels,” Mayo Clin Proc, 1982, 57(4):211-8. McQuaid KR, “Much Ado About Gastrin,” J Clin Gastroenterol, 1991, 13(3):249-54. Modlin IM, Jaffe BM, Sank A, et al, “The Early Diagnosis of Gastrinoma,” Ann Surg, 1982, 196(5):512-7. Solcia E, Capella C, Fiocca R, et al, “The Gastroenteropancreatic Endocrine System and Related Tumors,” Gastroenterol Clin North Am, 1989, 18(4):671-93. Warburton R and Close JR, “The In Vitro Stability of Gastrin in Serum and Whole Blood,” Ann Clin Biochem, 1987, 24(Pt 3):320-1. Wolfe MM, Jain DK, and Edgerton JR, “Zollinger-Ellison Syndrome Associated With Persistently Normal Fasting Serum Gastrin Concentrations,” Ann Intern Med, 1985, 103(2):215-7.